This wasn’t the pup’s first partnership with other organizations to raise awareness for important issues. When dogs give out hugs no sane animal lover turns down that hug. 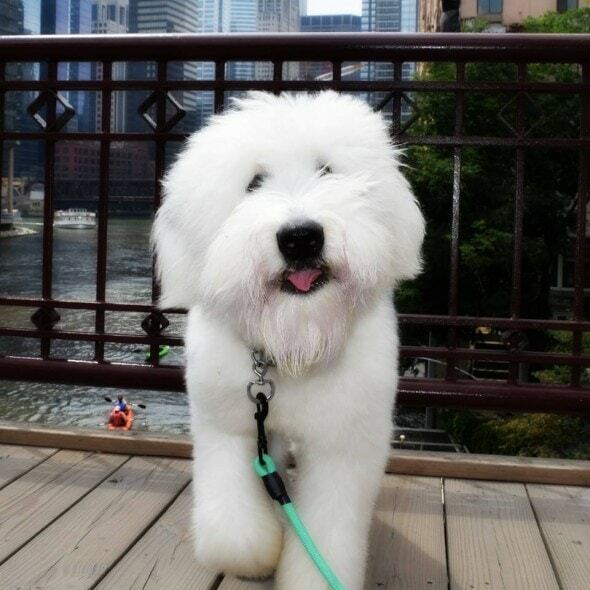 Santiago, an Old English Sheepdog gave out hugs to Chicagoans on July 26, 2015, and raised hundreds of dollars by asking hug recipients to donate $1 to Whole Cities, a foundation aiming to improve individual and community health through collaborative partnerships, education, and broader access to nutritious food. “Santi is aware that almost 24 million Americans live in neighborhoods with little access to fresh, healthy foods and wanted to help make a difference,” explained the proud pup’s owner. This wasn’t the pup’s first partnership with other organizations to raise awareness for important issues. In the past, Santiago collaborated with P.A.W.S. Chicago and participated in a benefiting event for the Anti-Cruelty Society. The Sheepdog lost his mother and siblings at birth and it was later discovered he was deaf. However, his disability has not damper his personality or his willingness to help others in need. Thanks to obedience school and learning sign language the dog overcame his own obstacles and flourished into the active, happy and activist dog he is today. When he is not riding in his bike trailer, hanging at the dog park, eating veggies or swimming, he is walking around Chicago, Ill., making people smile. I want a hug!! So adorable! What a delightful joy. Wonderful ! I have a sheepdog…they love hugs! I would pay five dollars to hug this dog. 25 years since I lost my O.E.S .he was the sweetest most gentle,loving dog in the whole world. He was my baby and loved hugs. Still cry whenever I see one .